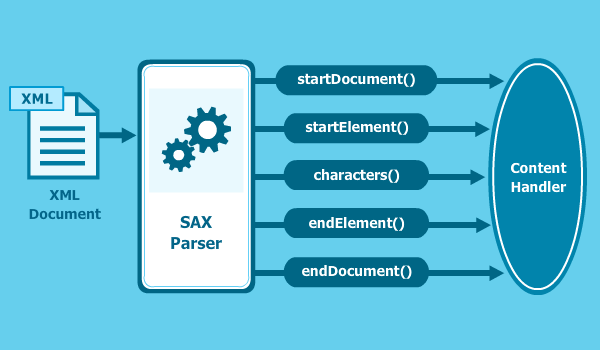 Before getting into the details on how to parse XML files using SAX parser, let’s first see what is the difference between parsing through different parsers and when to choose one over the other. 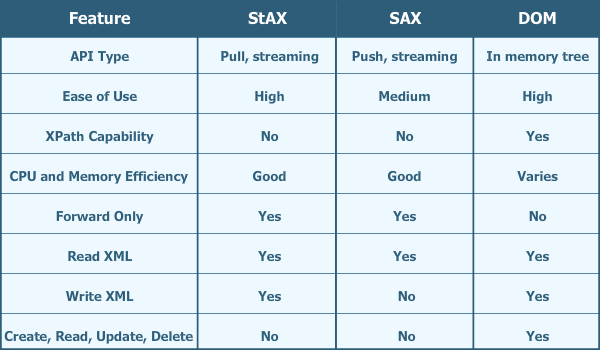 StAX Parser – StAX is an acronym for Streaming API for XML. Stream-based parsers are very useful when your application has memory limitations. For example, a cellphone running Java Micro Edition. Similarly, if your application needs to process several requests simultaneously, for example an application server, StAX parser should be used. Pull Parsing – In pull parsing, client application calls for methods on an XML parsing library when it needs to interact with an XML infoset. In other words, client only gets XML data when it explicitly asks for it. Push Parsing – In push parsing, it is the XML parser which pushes XML data to the client, when it encounters elements in an XML infoset. In other words, parser sends the data to application irrespective of the application being ready to use it or not. + ", runtime=" + runtime + ", released=" + released + ", cast="
Note: There are many other callback methods like startDocument(), endDocument() etc. that can be overridden if required. Now let’s test our SAXHandler. 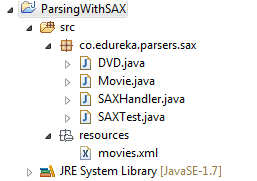 Below is the test class SAXTest where we first get an instance of SAXParser from SAXParserFactory and call the parse method which takes two arguments: A File and a handler instance. Note : If you are trying to parse an XML file with different structures from movies.xml, then the code in the methods startElement() and endElement() needs to be changed. All You Need To Pick The Right Tableau Product!